Once available only in Japan, the Richie Kotzen Telecaster is now available to a worldwide audience. Known for stints with Poison and Mr. Big and for his own prolific career as a solo artist and sideman, Kotzen has long wowed audiences with his impeccable chops and deft Telecaster artistry. 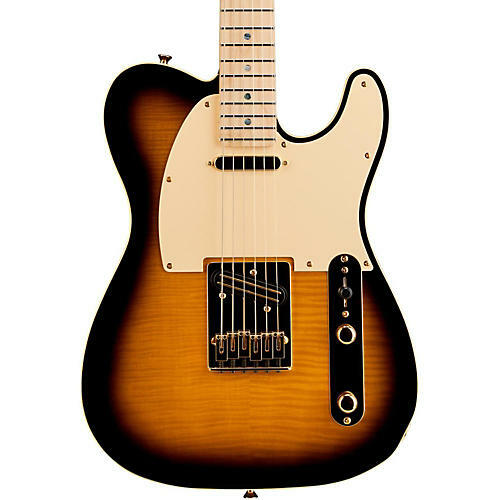 His signature Telecaster model features a beautiful flame maple top on an ash body, with a distinctive combination of DiMarzio Twang King (neck) and Chopper T (bridge) pickups. Other premium features include a satin-finish maple neck with a large "C"-shaped profile, 12"-radius maple fingerboard with 22 jumbo frets and pearloid dot inlays, three-way blade pickup switch with "barrel" tip, master volume control and rotary series/parallel switch, single-ply cream pickguard, gold six-saddle through-body Telecaster bridge, Gotoh sealed tuners and gold hardware. Case sold separately.